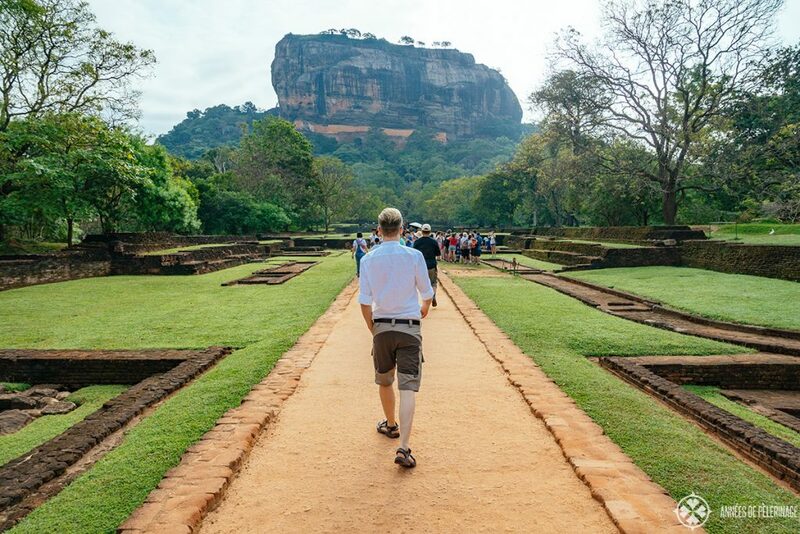 A first-hand travel guide to climbing Sigiriya, Sri Lanka and everything you need to plan your visit of the Lion Rock. 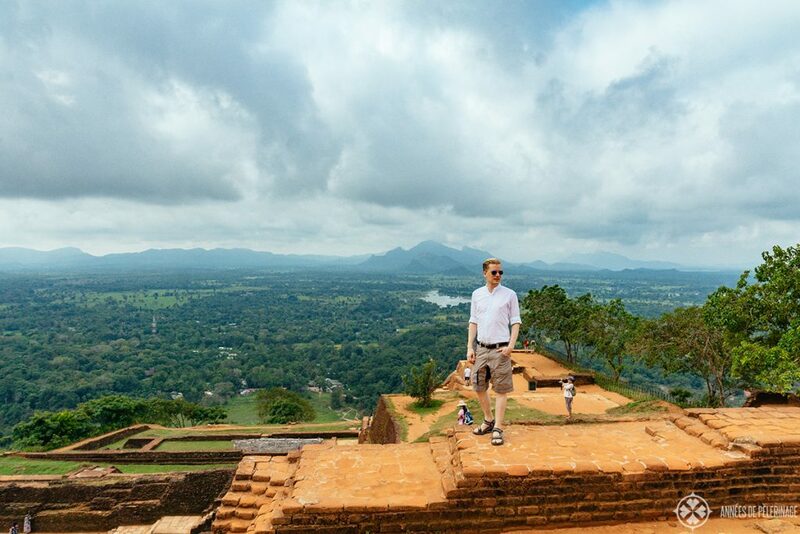 Hidden deep in the jungle of Sri Lanka’s central province, lies an amazing UNESCO World Heritage site of truly epic proportions: The Sigiriya Lion Rock Fortress. What once was the sole domain of King Kashyapa I can now be visited. 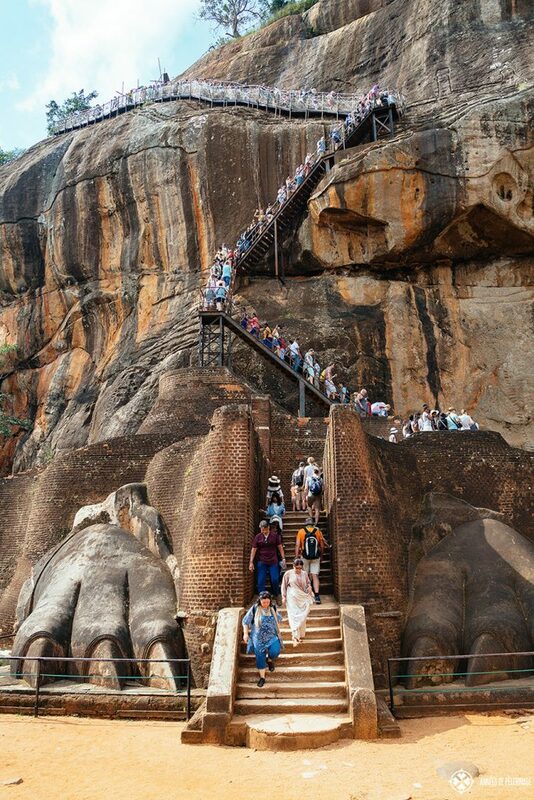 It is part of my list of the 20 best places to visit in Sri Lanka and has been named the Eighth Wonder of the World. 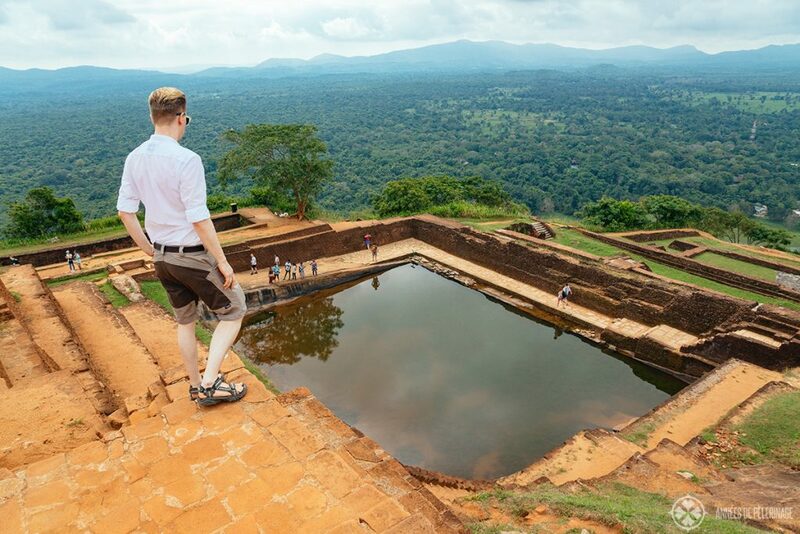 Here is what you should know about climbing Sigiriya. 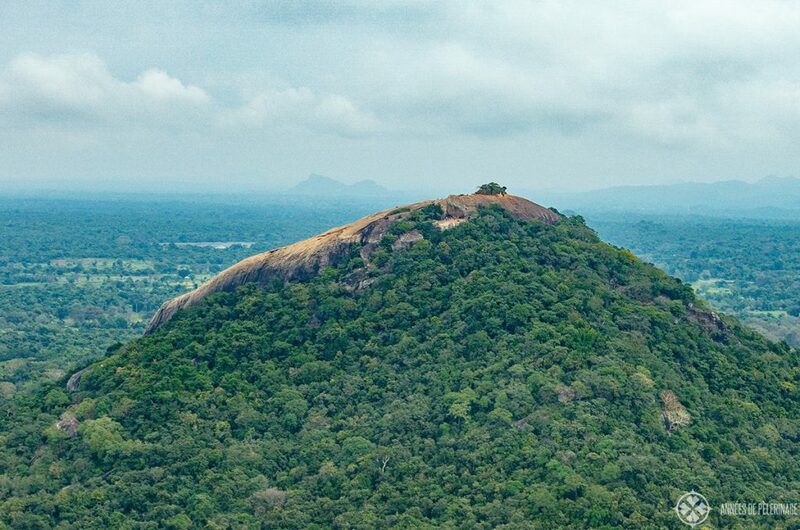 Evidence suggests, that the area around Sigiriya was inhabited in prehistoric times, probably as early as 3,000 BC. But it was Kashyapa I who started the construction in earnest. 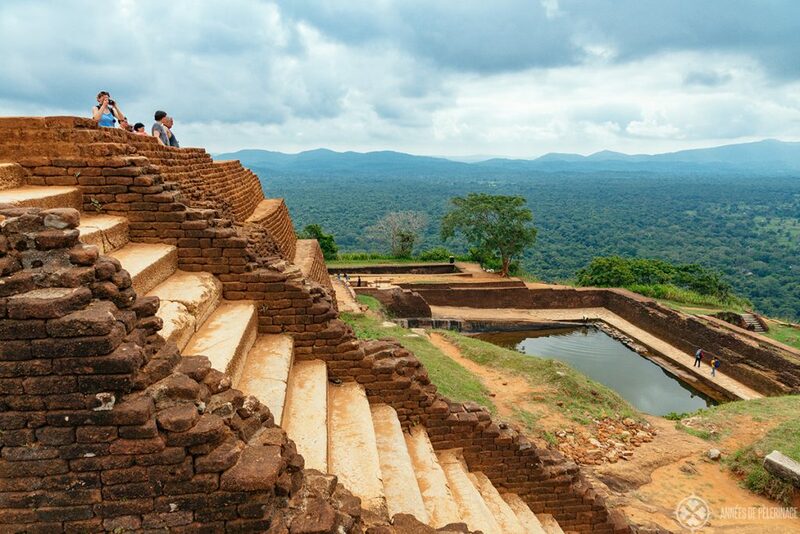 His reign lasted from 477 to 495 CE, and most of what you will see around Sigiriya was developed during this time. Kashyapa was only the son of a non-royal consort but managed to seize control of the kingdom with the help of the King’s nephew and army commander, Migara. Fearing retribution from the rightful heir Moggallana (who fled to South India), he moved the capital from Anuradhapura to Sigiriya and built a fortress there. Much like in a fairy-tale, Moggallana returned and defeated Kashyapa’s army in 495 CE. 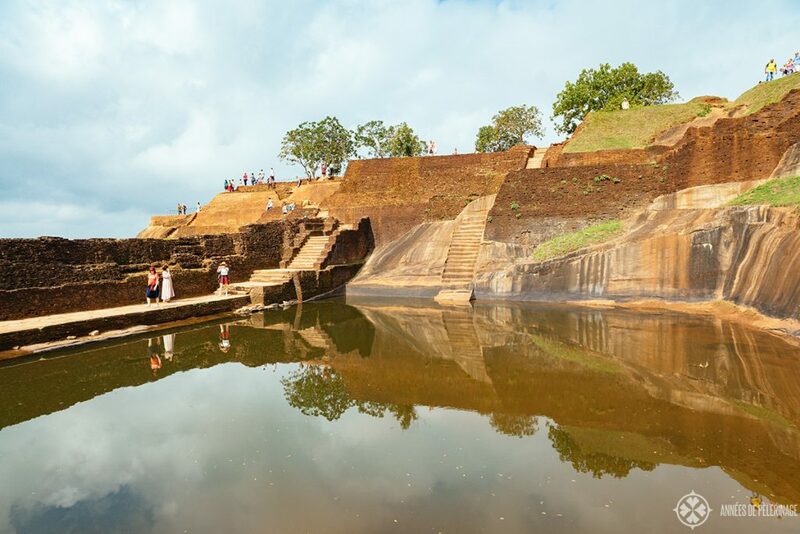 Sigiriya was then converted into a Buddhist monastery complex and remained so until around the 13th century. It was this vast history that made the UNESCO inscribe it a World Heritage site in 1982. The hike up the top of the Lion Fortress is quite a wonderful experience, especially as is anything but boring. 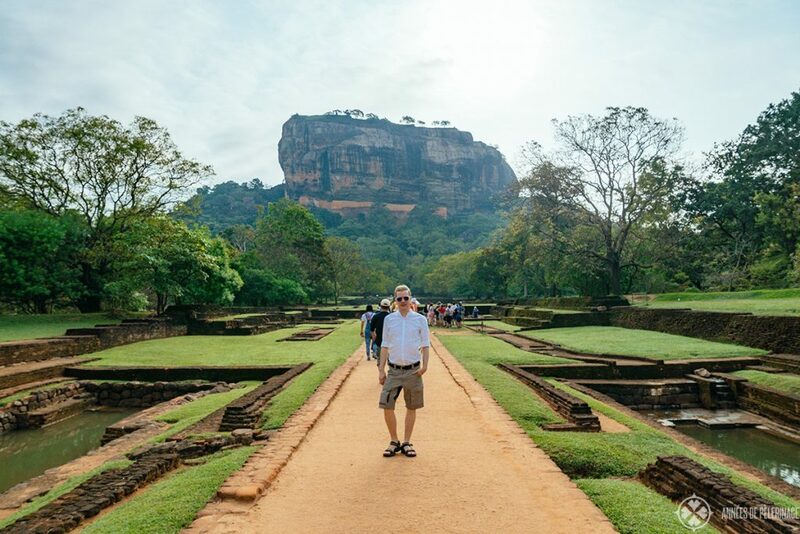 All in all, you will be able to experience four totally different architectural zones, which is just one of the many reasons climbing Sigiriya is an essential part of any Sri Lanka itinerary (click to read mine). 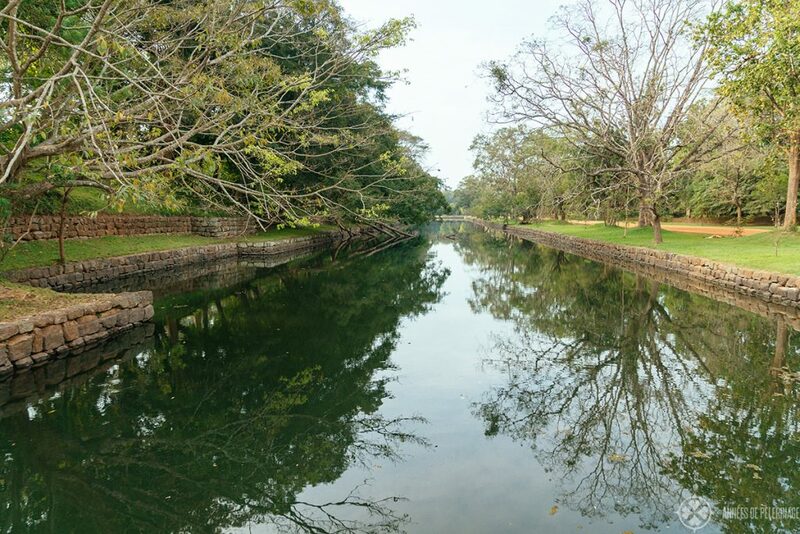 You might be delighted to hear that all around Sigiriya you will find beautiful water gardens. Part moat, part gardens of exceptional beauty, crossing the verdant perimeter around the actual fortress will not disappoint you! Hidden among the many small recesses, you will find small caves, fountains, temples, pools, and lookouts, you really shouldn’t miss. 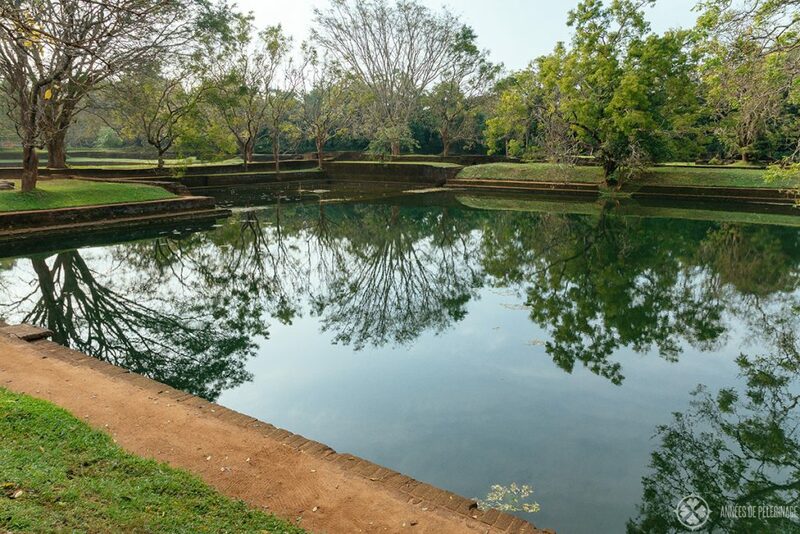 Be aware that the Sigiriya water gardens are recognized as one of the oldest landscape gardens in the world. A good guide will be able to put it all into its historical context, but I’m sure you’ll be able to enjoy the tranquil scenery without one as well. Just don’t expect to be the only tourist looking for one of the coveted pictures with the rock fortress in the background. Especially the direct approach to the main stairs can be quite crowded! Take your time, and if you wait long enough, a window for the perfect travel memory will appear. Follow the long avenue towards the rock until you reach the Boulder Gardens. Huge monoliths are scaring the landscape here – unlike the perfect symmetries you’ve seen before. At times, you will see what appears to be stairs, but these were meant to support the brick and timber walls of the monastic buildings once abutting the large stones. 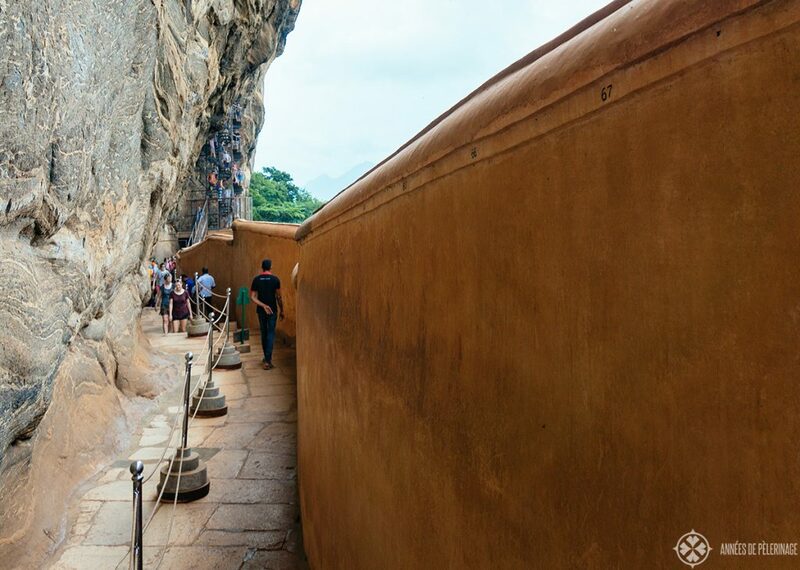 To the left and to the right, you’ll find plenty of little sights like the Cobra Hood Cave or the Deraniyagala cave with a well-preserved dripstone ledge and some remains of old paintings. Further to the left, you will also be able to see the fundament of the magnificent Audience Hall built on an especially large rock plateau. An enormous throne (some five meters wide) takes the center stage. In all likelihood, this was used for religious purposes only, with Buddha taking the center stage. 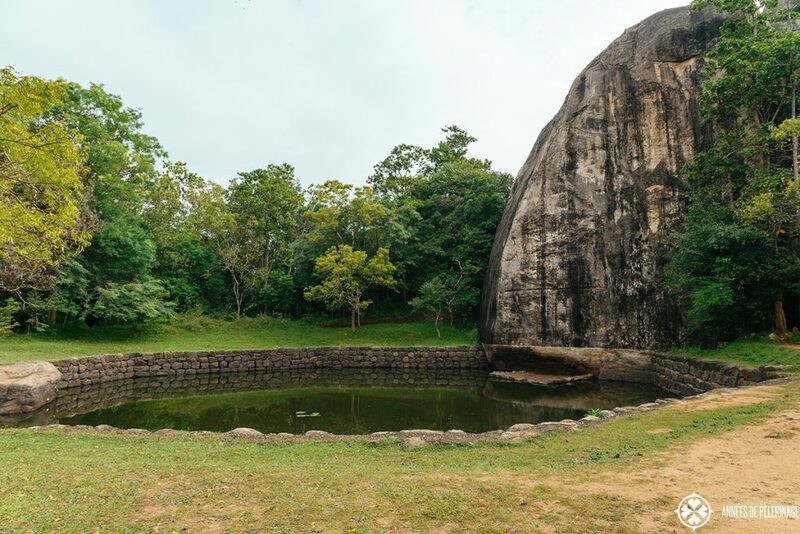 Once you explored all the little niches (don’t miss the octagonal pool), you’ll start your climb up to the Sigiriya Lion Rock through the natural Boulder Arch. 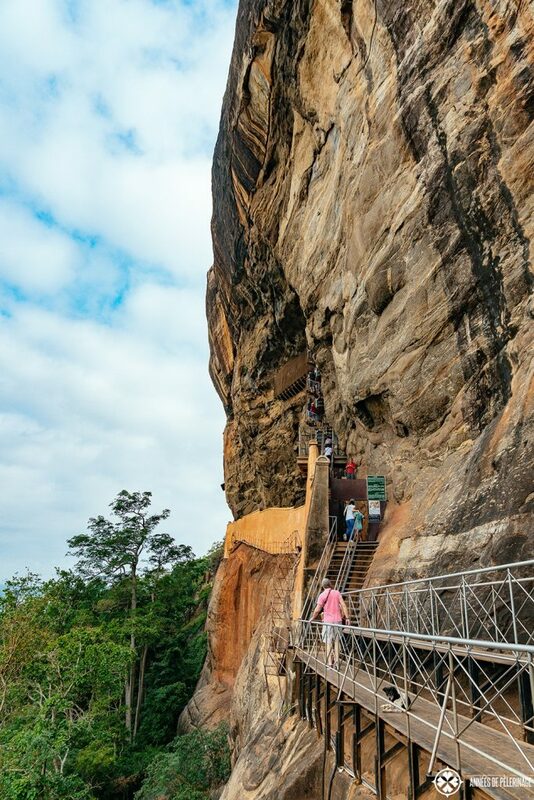 What follows is a long and winded set of staircases that will bring you to the fabled Mirror Wall of Sigiriya. This huge wall was originally coated with a mixture of egg white, beeswax, lime and honey and polished to a near mirror-like sheen. It is said that King Kashyapa walked past this wall heading back from training to admire his form. If you look closely, you’ll see plenty of ancient graffiti covering the Mirror wall – some of it dating back to the 7th century. A good indication of how old the touristic pilgrimage to Sigiriya is. 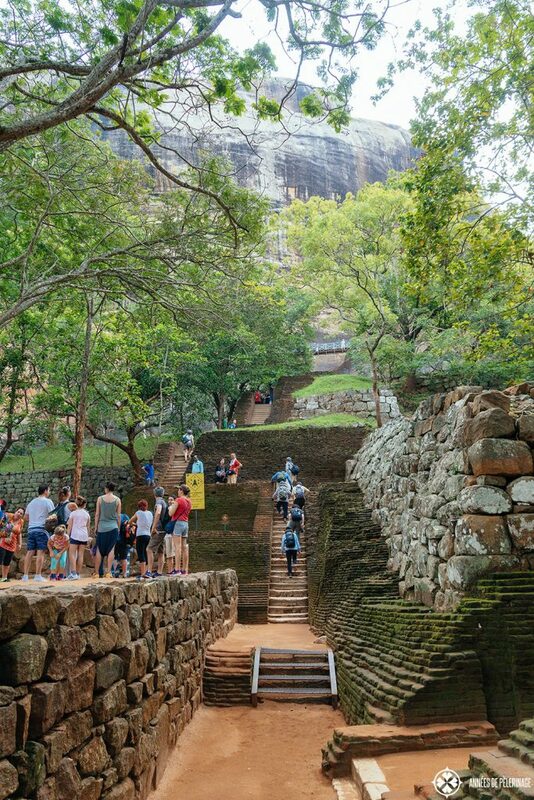 A spiral staircase will deliver you to the true highlight of the Lion Rock: The Sigiriya Damsel. Under a ledge frescos of altogether, 21 damsels survived the ages. 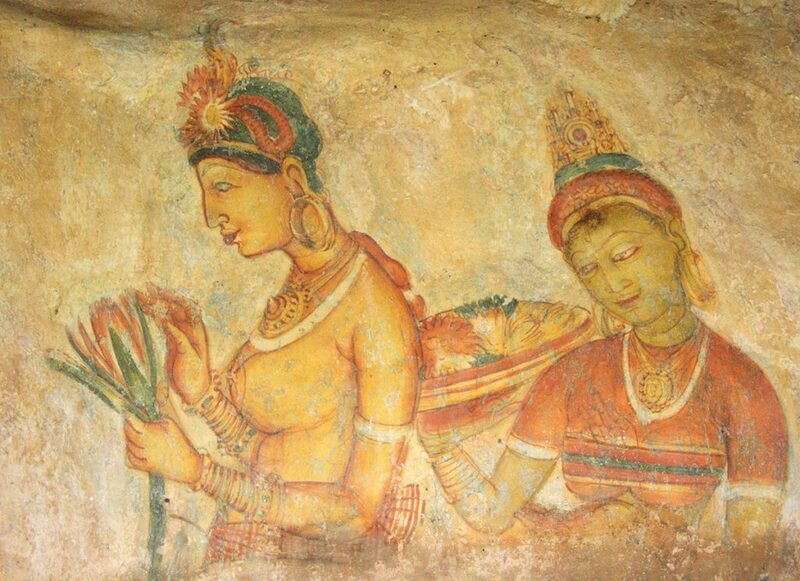 They were painted in the 5th century and are the only non-religious images known from ancient Sri Lanka. Scientists surmise that they depict so-called Apsaras, celestial nymphs, though some content they are in fact depictions of beauties from the court of Kashyapa. Once the frescoes covered an area of more than 140 meters, with a height of 40 meters. Once you cleared the Mirror Wall, you will reach a little plateau. It is here you will find the remains of a gigantic lion statue that flank the stairs to the very top. 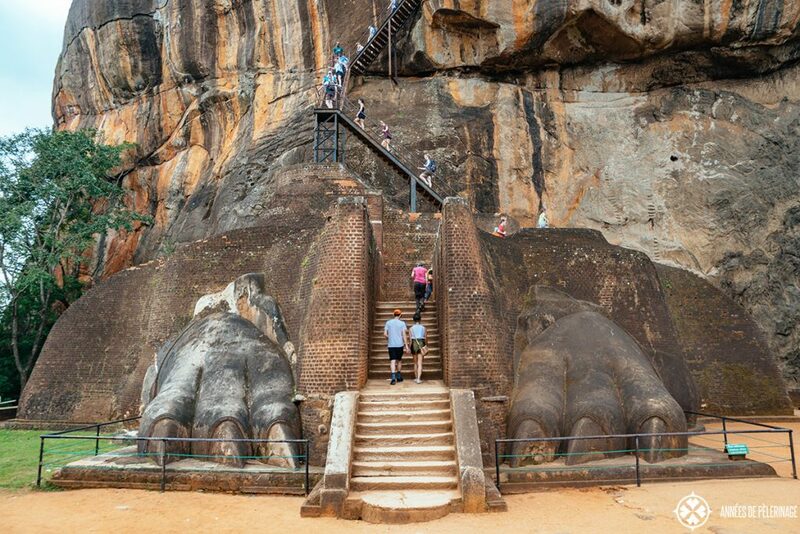 The sheer size of the paws might give you a good idea of the awe-inspiring impression it must have left on visitors in times past – may the have been friendly or not. The stairs can be quite crowded and parts of them are quite vertigo-inducing, but passing through the Lion Gate will make you feel a bit like king Kashyapa. I do recommend you to pause a bit before you proceed. The last bit is actually the steepest and hottest part of the climb. 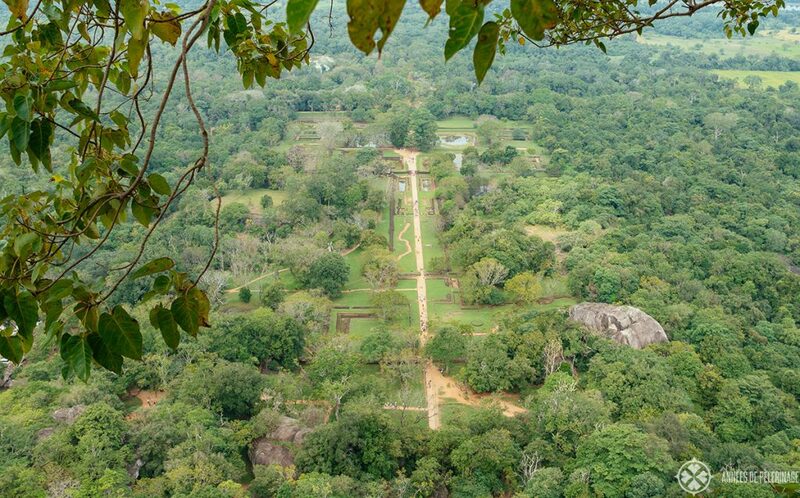 Once you climbed Sigiriya, take a deep breath and enjoy the view of the surrounding areas. Right behind you, you’ll be able to see the Pidurangala rock (more on that later). I suggest you’ll find yourself a neat spot and sit down to recover from the rather difficult hike. What once must have been a sprawling complex of gardens and halls, is now just a field of ruins. Yet, the ancient cisterns who supported the palace are still functional – which is quite the marvel, if you think about it. 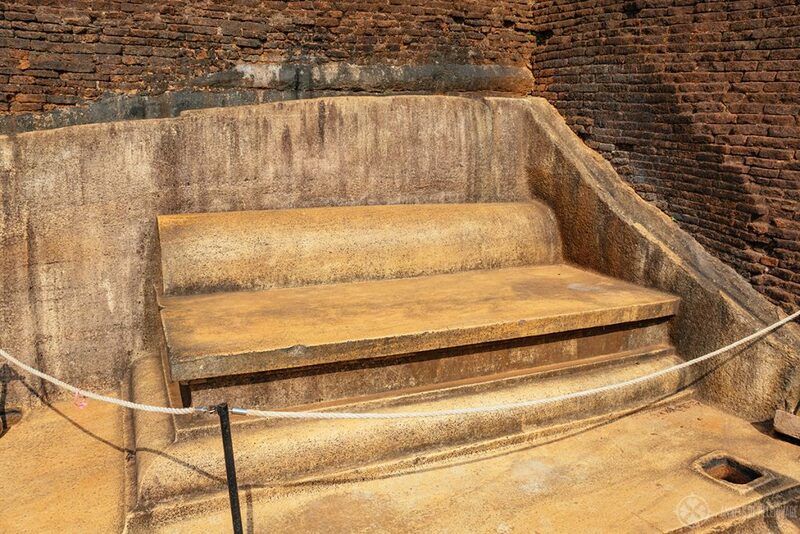 You’ll also be able to see the throne where King Kassapa once must have sat. Use your imagination to build the wooden superstructures that once must have created audience halls, harems, kitchens and sleeping quarters. The combination of fortress and pleasure gardens must have been breathtaking sights to behold! Other than a sheer endless amount of quite thick walls and terraces, there is really little to see at the top itself. Yet, there is certain timeless tranquility you will only be able to capture if you take a few minutes to sit down. Once you sated all your visual needs, you’ll have to climb down the way you came up. Sigiriya also has a museum attached to it, and this is where you actually have to buy the tickets to enter the Lion Rock. I do have to say it didn’t exactly leave a memorable impression on me. Sure, there are some nice exhibits on display, but it all feels a bit outdated. If you are a true history buff (like I am), I’m sure you’ll find something among the scattered rooms. At the end of the day you paid for it, and it probably won’t inconvenience you all too much if you take a peek and decide for yourself. The artifacts found around the ruins will be able to fill the many gaps the fascinating palace at the very top leaves open. But again, Sigiriya is beautiful in and by itself already. Calculate about 30 to 60 extra minutes if you want to see the museum. 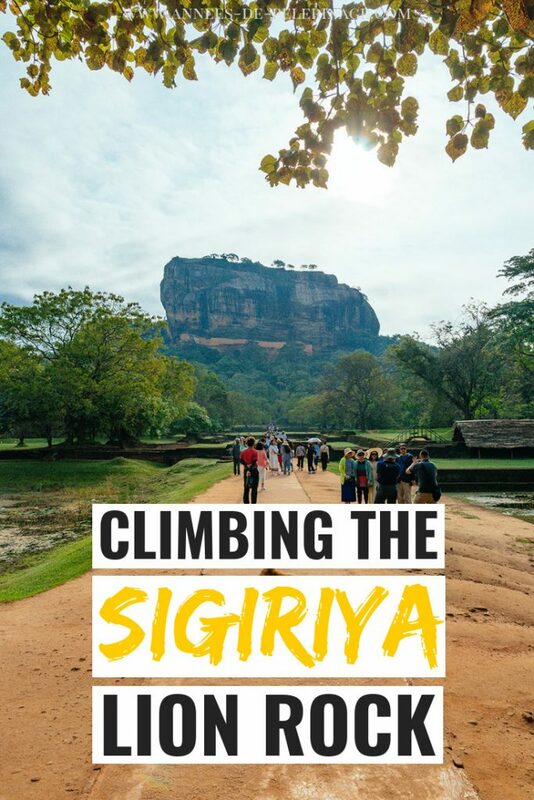 How long does it take to climb Sigiriya? The climb all the way to the top can take between 1.5 hours and 3 hours – depending on your fitness, how crowded the place is and how many pictures you are shooting. As the view from the top is quite stunning and you might need some time to catch your breath, I’d rather err on the longer side. You will have to climb about 1,200 steps before you reach the very top of the Lion Rock. Don’t imagine one continuous staircase, but rather a succession of little platforms, walkways, and stairs. Some of them are hewn into the rough rock, others will remind you of fire escape stairs. So, it’s quite a mixed affair. There are also a few places where you can rest and sit down. 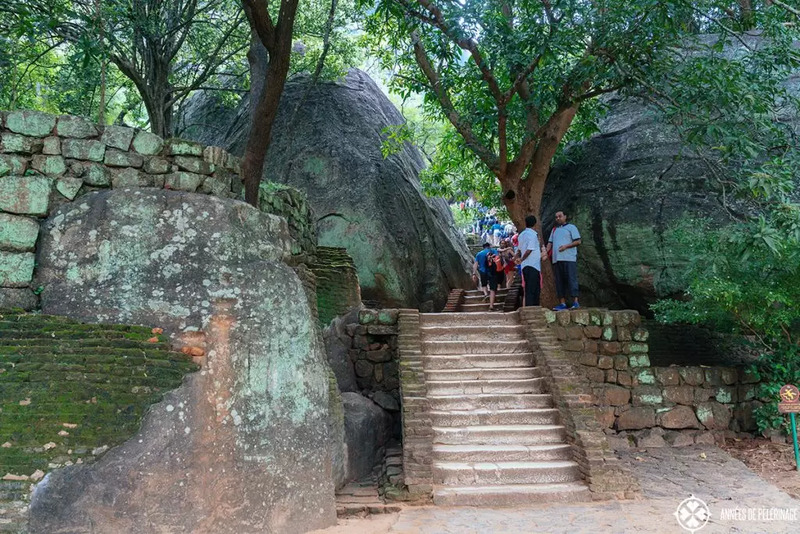 Sigiriya has no elevator, but you could take walking sticks (but not sure how helpful they would actually be on all those stairs). The climb up Sigiriya is quite strenuous, mostly because of the high humidity and the intense heat, not because of the actual hike. Actually, I found the incline to be the least problem and not all that difficult. Never was my breath winded at any point, but I sweated like crazy and would recommend wearing some fast drying sports t-shirts. Imaging a house with 15 floors in Miami without an a/c. 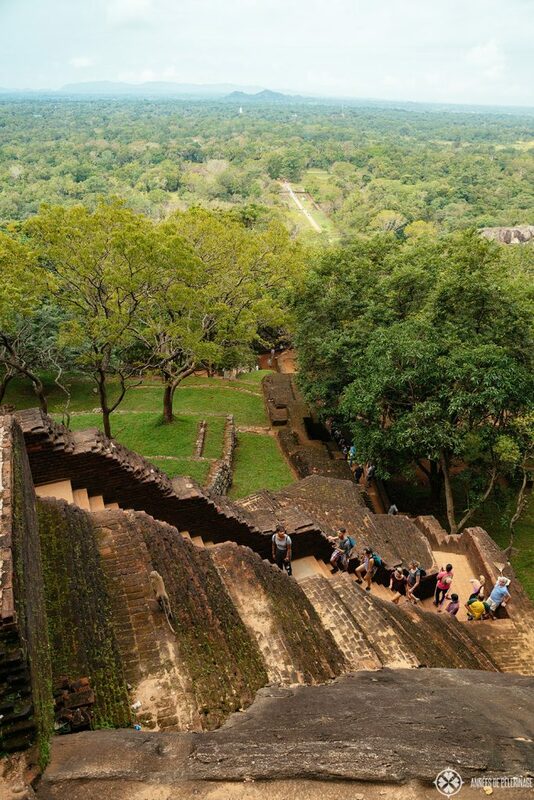 If you’d have serious troubles climbing the stairs to the top, then I’m not sure Sigiriya is the right place for you. 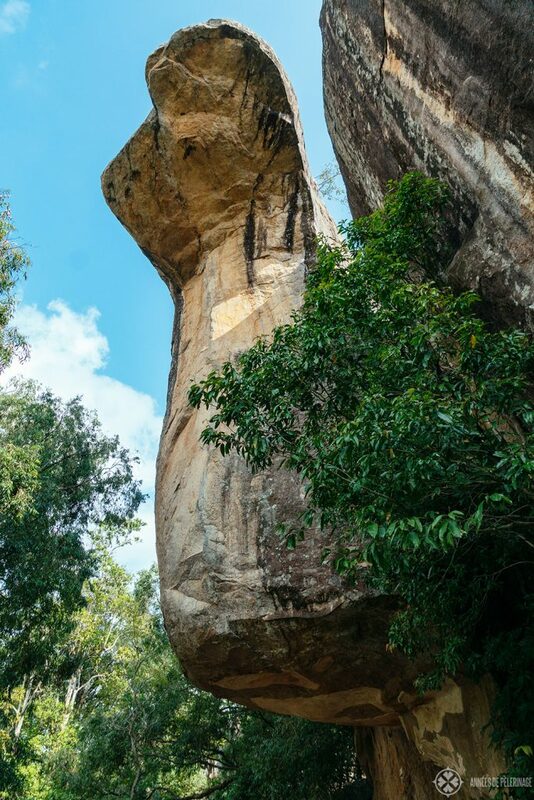 Please be aware that the very last bit of climb, from about the base of the lion’s paws, might be a problem with people suffering from vertigo. It’s also the steepest part of the climb. Worried about travel safety in Sri Lanka? I wrote a guide you definitely should check out. 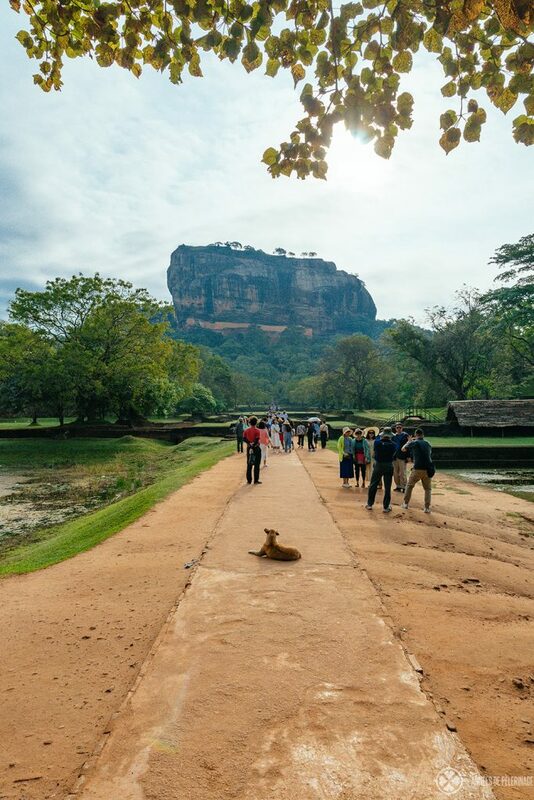 The Sigiriya Lion Rock is open every day from 7:00 am to 5:30 pm (last admittance at 5:00 pm). As the heat builds up quite quickly after dawn, it is recommended to visit Sigiriya very early in the morning. Also, most big tourists buses will arrive at around 9-10 am. By then, the stairs up to the plateau are usually quite congested to a point where it looks like one big ant road. Tickets for Sigiriya are quite expensive. Foreigners have to pay 30 USD per person. 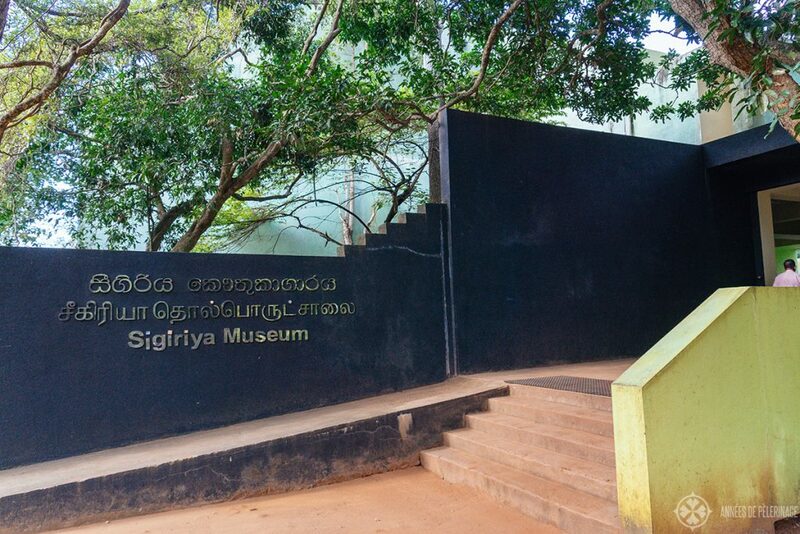 Entrance to the adjacent Sigiriya museum is included in this price. You can either pay in USD or in Sri Lankan rupees. Citizens of SAARC Countries only pay 15 USD, while the ticket price for Sri Lankans is 100 LKR. 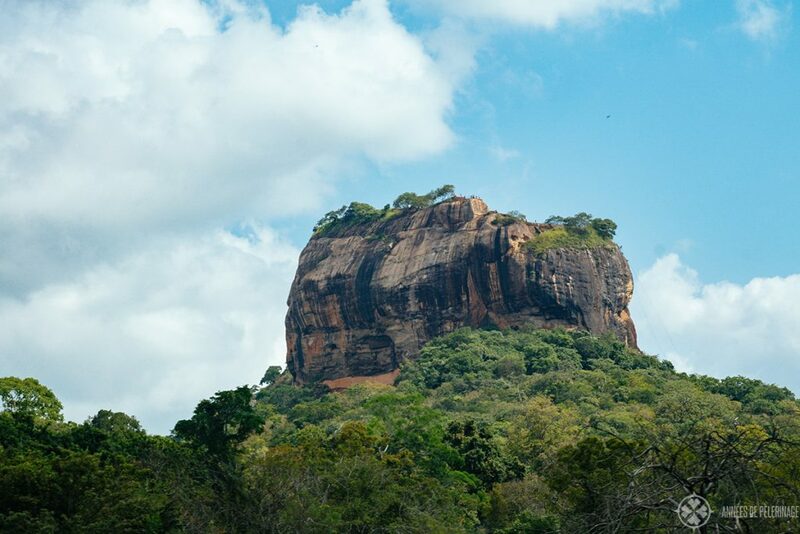 Right next to Sigiriya you will see another majestic rock formation called Pidurangala rock. 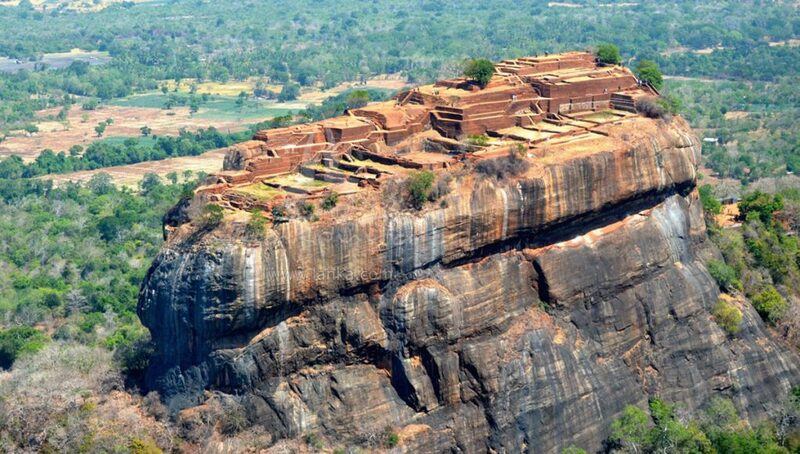 Unlike Sigiriya, there are is no ancient palace at the top. It does, however, offer a wonderful view of the latter, which is why many tourists choose to climb it. 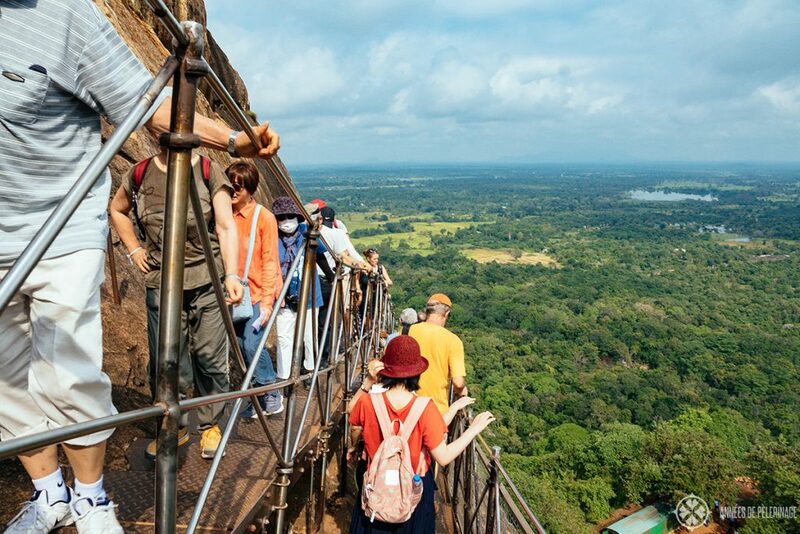 It’s also a nice way to avoid the rather steep entrance fee of Sigiriya. That being said, I would only recommend it if your budget is super tight and not as a true alternative. 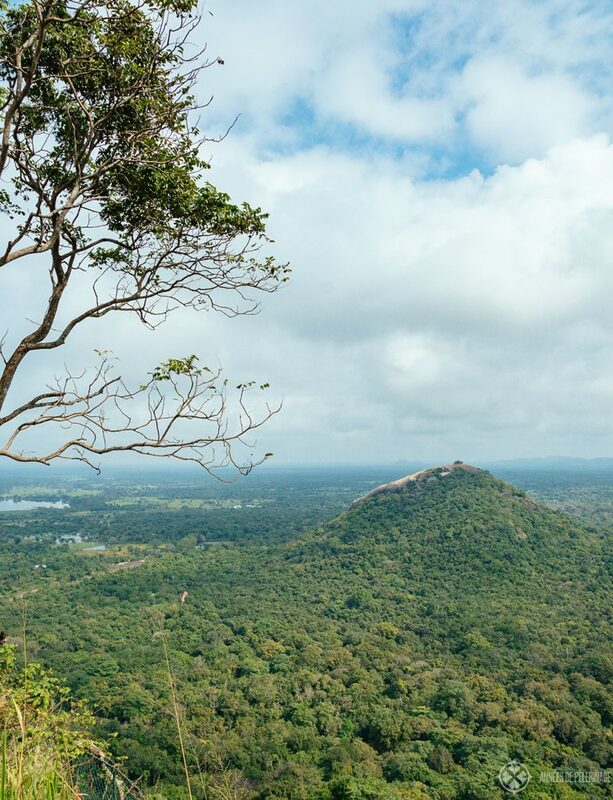 The hike makes for a beautiful addition, though, and it’s an exceptional place to watch the sunrise or sunset over Sigiriya. Note: If you want to shoot a clear picture, you will need a telephoto lens (or a good zoom). Sigriya is about 1 kilometer away. 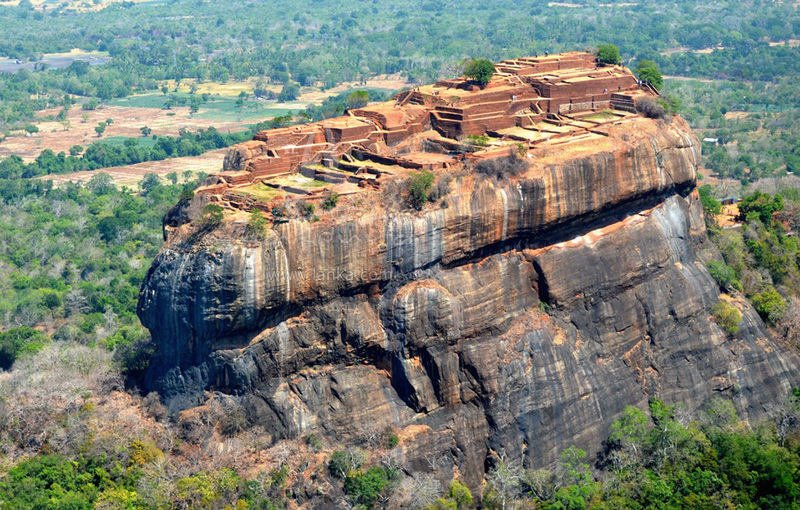 Sigiriya is the most popular tourist attraction in Sri Lanka, and you will have to problem finding a hotel nearby. I’d recommend something very close to Dambulla, as it’s the perfect place to explore the rest of the area as well (Minneriya, Polonnaruwa, etc). There’s also some cool national parks (check my Sri Lanka safari guide). 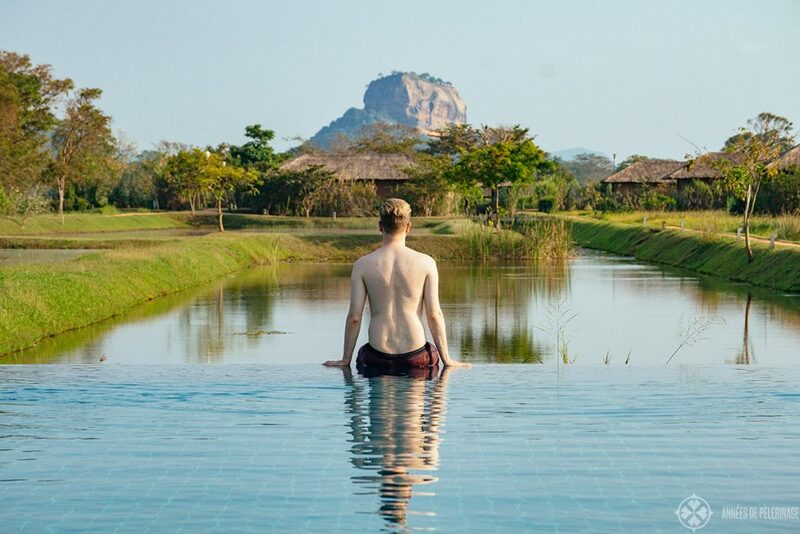 The very best hotel with a perfect view of the Lion Rock is the Water Graden Sigiriya hotel (click for prices & booking). It’s a perfect 5-star luxury hotel. Most of the villas have their own pool. I stayed there for 3 nights and enjoyed every single second. It was not only the lovely food and the perfect rooms but also the fact that the hotel is an attraction in itself. The water gardens around the hotel are home to a sheer abundance of birds. Peacocks, hornbills, bee-eaters – you can observe the whole panoply of Sri Lankan wildlife right from your private terrace. 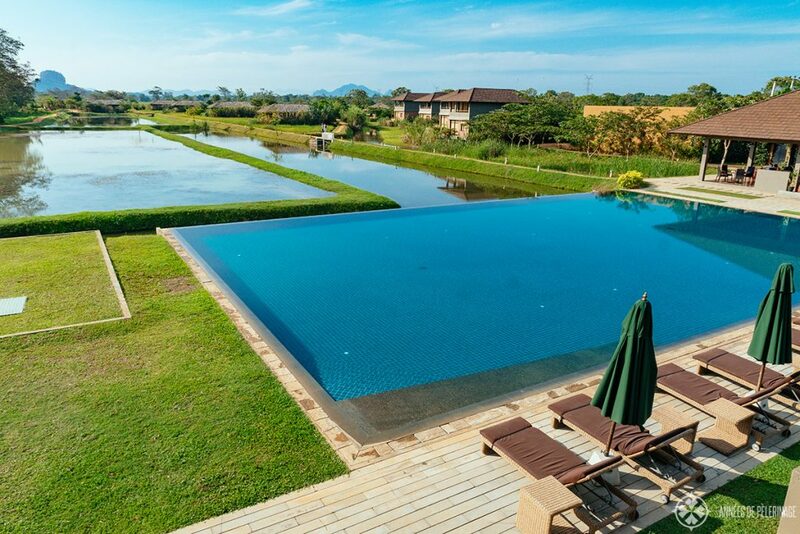 Less pricey, but with a somewhat similar view would be the Aliya Resort and Spa (prices & more pictures here) or the Hotel Sigiriya (check it out here). An excellent alternative, but without a view of the Lion Rock, would be the Heritance Kandalama (check it out here). The views are, nevertheless extraordinary. 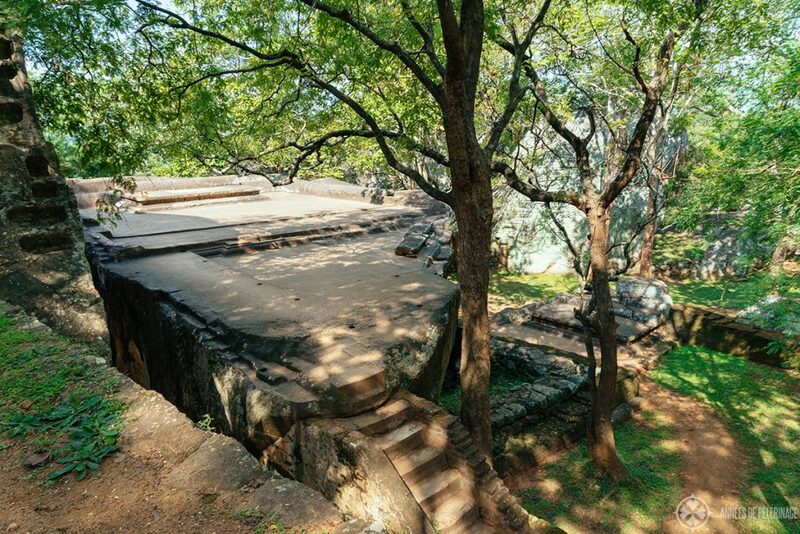 A budget alternative very close to Sigiriya is the Chena huts Eco Resort (book it here). Some of the rooms actually do have a lovely view. The price is certainly quite the bargain for the kind hospitality. 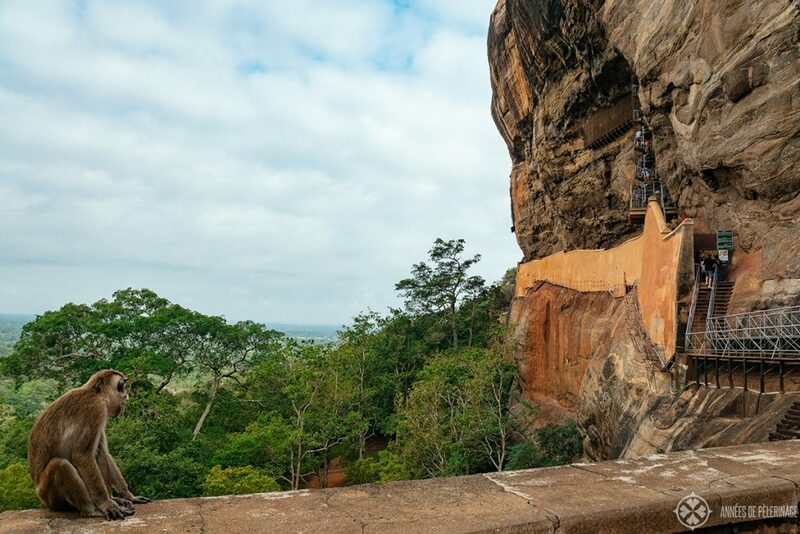 So, this was my little climbing Sigiriya blog post. Hope I was able to fill in all the blanks for you. Got any questions? Feel free to ask them in the comments below.